Hi everyone, it’s Millie & Walter here! 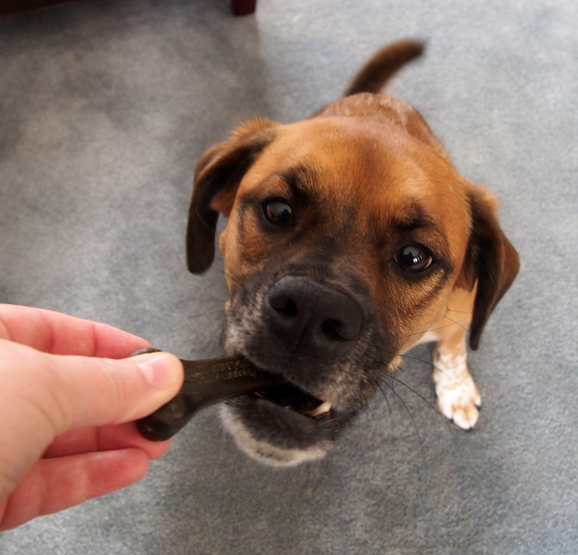 It’s time for this month’s Chewy.com review. First we have to call out our mom for Mischief Monday. Our last post was 4 weeks ago! Now we give her a pass for about a week or so since she did go away to attend her nieces wedding but what is up with the past couple of weeks with no posts? She has no answer for us but vows to try to do better…we will see. Okay…enough of that…now we will get to the real reason for this post and that is our monthly review. Of course our mom also waited for the last day of the month to do this and she claims it’s because this month is the shortest of the year but we don’t buy that because it’s leap year so she had an extra day! 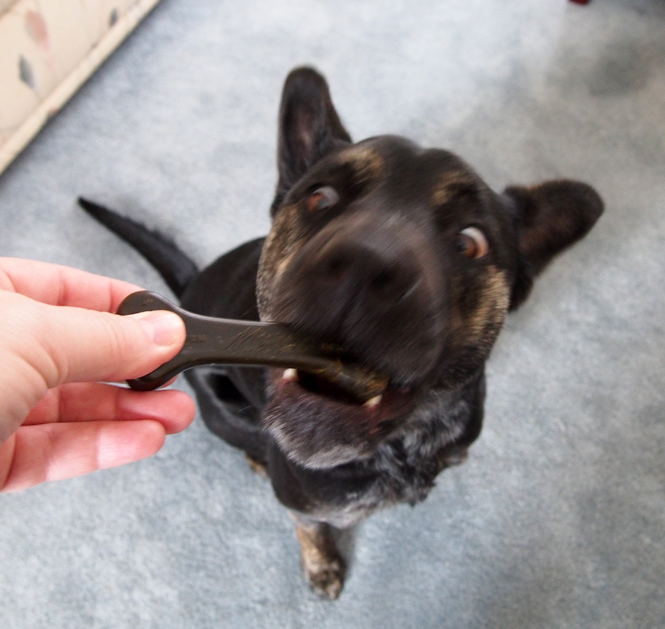 February is National Pet Oral Health Care Month so most of the choices were some sort of dental chew. 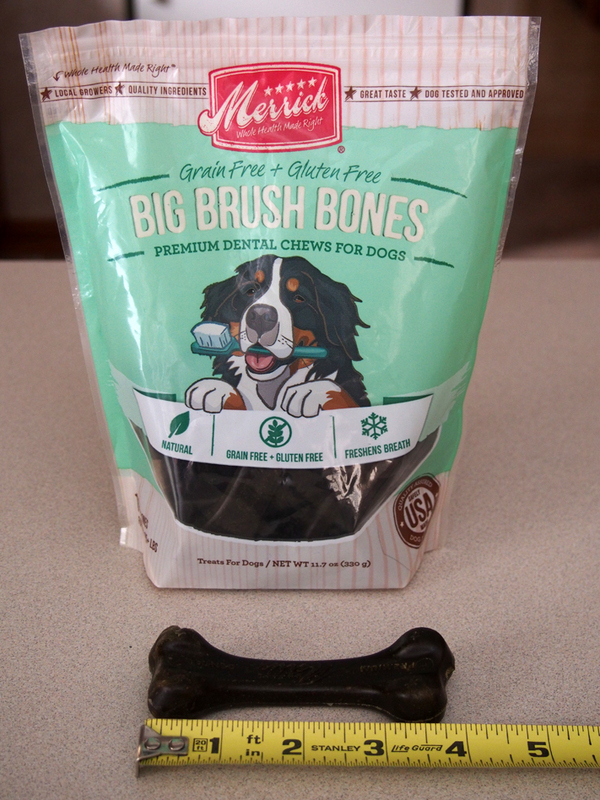 We get a different brand than this as a daily treat but since we eat Merrick food our mom decided to try the Merrick Big Brush Bones Grain-Free Dental Chews. These come in three different sizes but since we are big dogs we chose the big size. You can read all about what’s so good about them at the above links. 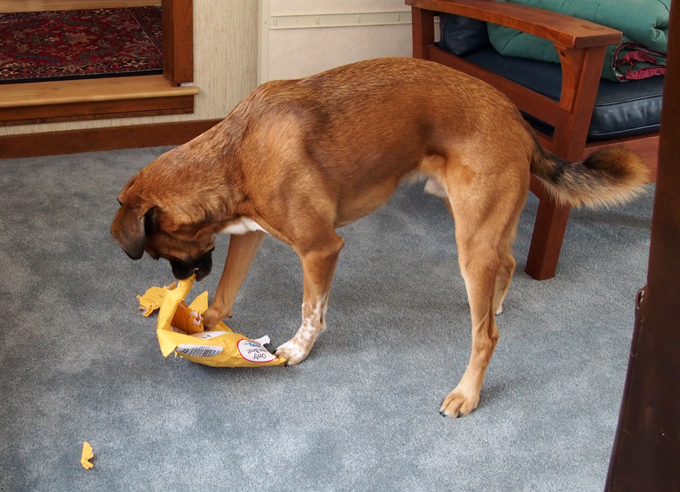 Of course the first thing you have to do is get the treats out of the envelope they came in. I love ripping these envelopes! Here is some video action of that effort. If you can’t see the video you can go here to see it. Great job Walter. You can stop destroying the envelope now. Once Walter finally got the treats out of the bag we were on to the important part of the review but of course we had to humor our mom and pose with the bag. Our mom likes the size of these bones for us. Stop teasing me mom and hand over the treat! I had to wait the longest to get mine so I was really anxious to get started. It took us a little while to eat these. Here is a little video of that action. As you can see even though it took us a while to finish these we loved them. There is no question this is an 8 paws up (because that is all the paws we have) great treat and we recommend them to all our friends. 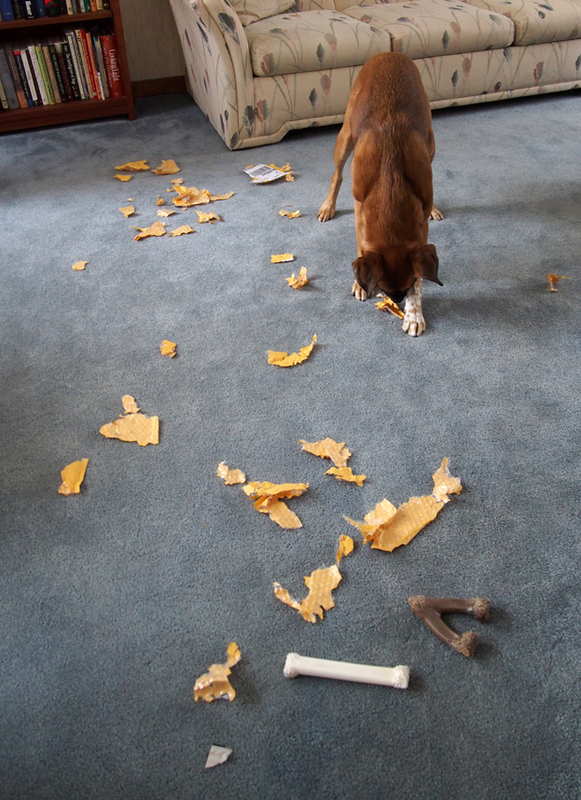 I had to finish destroying the envelope to make mom clean up a big mess. BOL! 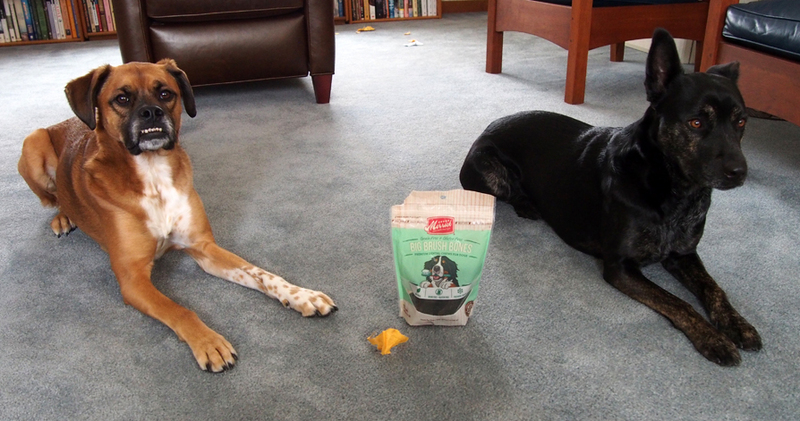 This month we are joining Oz the Terrier and Sugar the Golden Retriever for their Chewy.com blog hop. 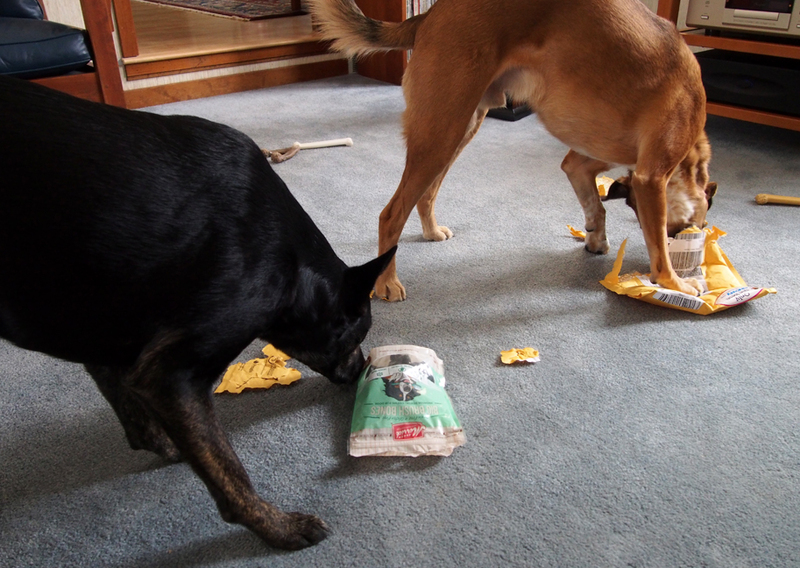 Disclaimer: We received one bag of Merrick Big Brush Bones Grain-Free Dental Chews from Chewy.com to review. We did not receive any monetary compensation for this review and will receive no additional benefits for barking about the product or the company. The opinions in this review are the honest opinions of ours. Hi everyone! It’s Millie & Walter here. We’re sorry we haven’t been blogging much but you know how difficult it can be to get good help sometimes. Well one of the things we have to tell you about is that our mom is abandoning us for about a week to go to a family wedding. She has promised to try to keep up reading your blogs but she probably won’t be able to comment on them. Don’t worry about us because our dad is staying home with us and we are sure we can con him into giving us a few extra treats while mom is gone. Now we want to tell you about some crazy weather we have been having around here. 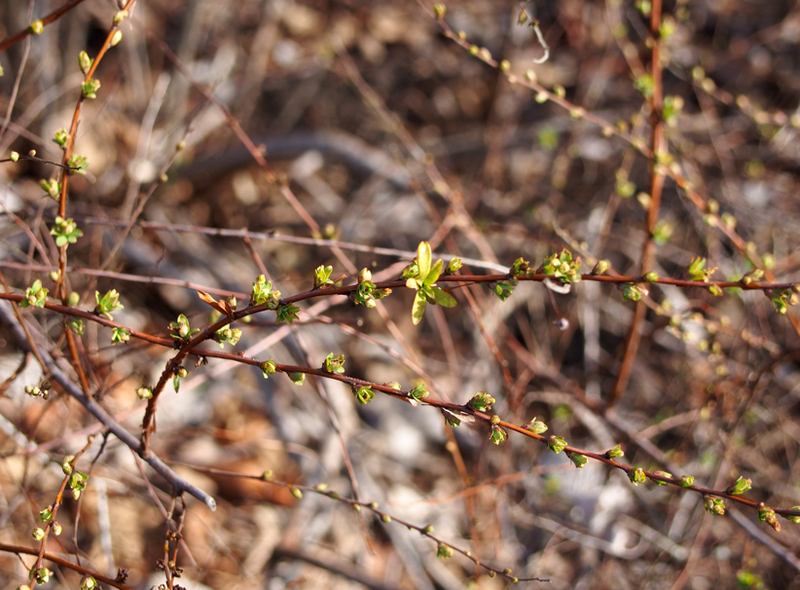 This crazy spirea is pushing out leaves a few months early. Last year at this time of year we had our usual covering of over a foot of snow in our yard. This year we are way below average for snow fall and right now we don’t have any in the yard. 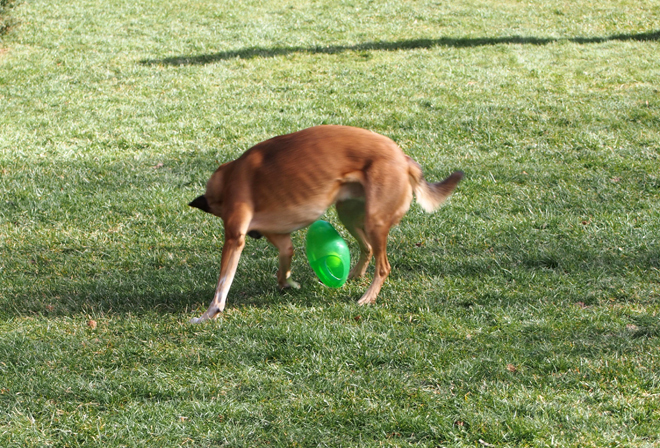 Mom and dad were saying they can’t remember a time when our grass looked so green in February. I’ll get that bone out of there soon. 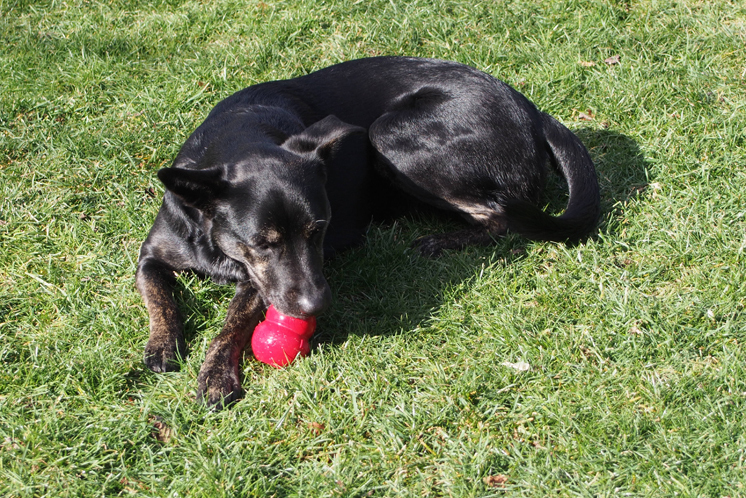 We enjoyed some time with stuffed Kongs. 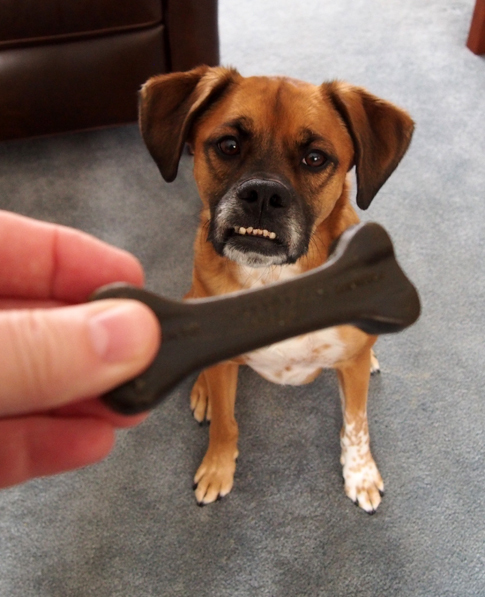 If I tip it up like this maybe the bone will fall out. 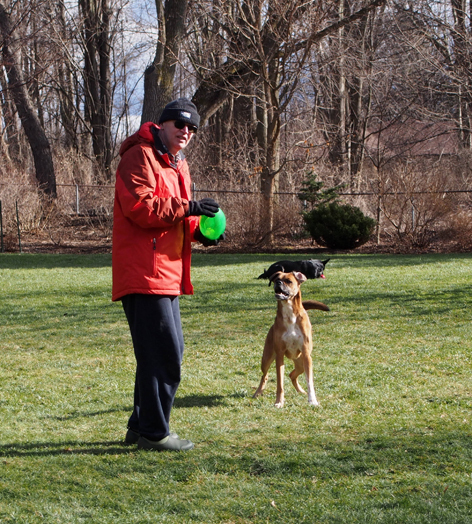 Then daddy brought out Walter’s favorite toy…the Kong Jumbler! Hey mom are you watching this? 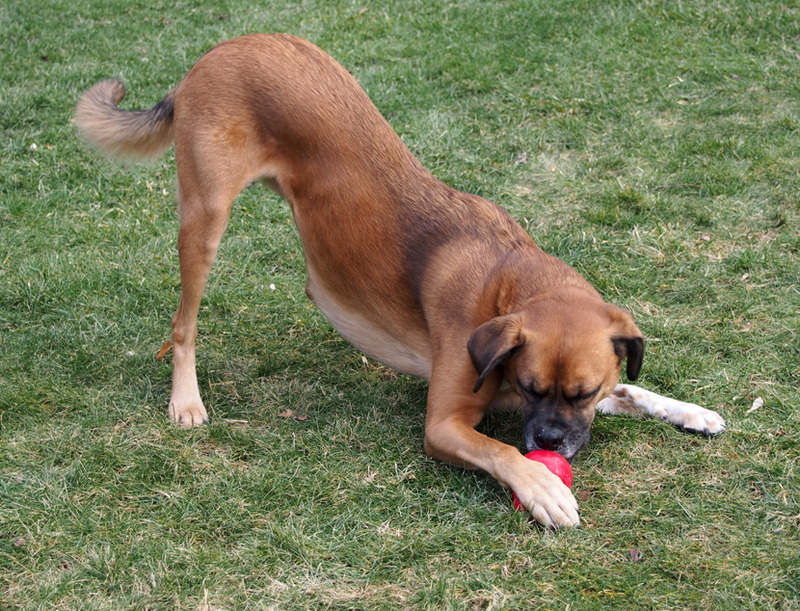 Walter goes crazy for this toy and will play almost forever. Here is a little video mom took of the action. We have enjoyed being able to play in our yard without so much snow and we know mom and dad don’t miss having to trudge through knee deep snow either. Well we hope to be back in action by the Valentine’s Day Parade that Sarge and Frankie & Ernie are hosting. Don’t forget to start sending us your stamps when you think you’ve received all your Christmas cards. 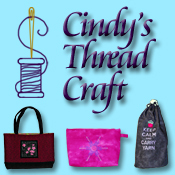 Just leave a comment if you need our mailing address. Thanks to those of you that have already sent your stamps to us.